Are You an Online Udemy Course Instructor? Do you have a specific niche interest? Do you need to understand your competitors? Are You an Udemy Course Student? Do you struggle to find the BEST courses to take? Udemy is a fantastic market place for online courses, we all agree! Now that it has grown so huge, finding the course you want can be really difficult! 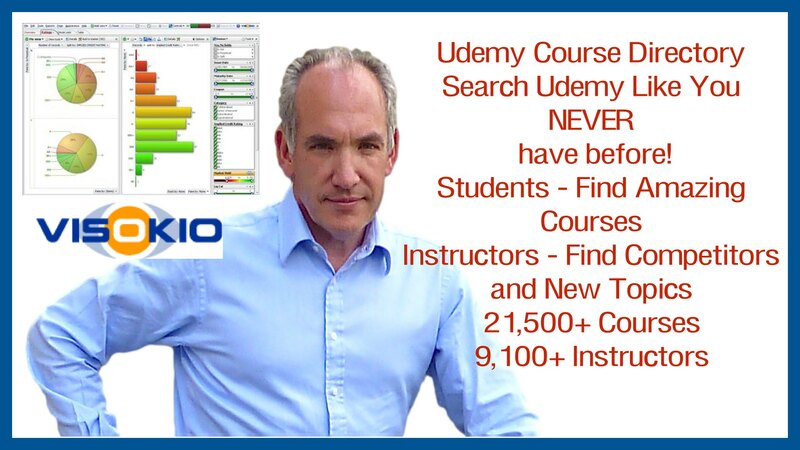 Just because Udemy puts it on the first page when you search, does not mean its either the best course or, more importantly, the best course for YOU! I have identified over 21,000 Courses from over 9,100 instructors and have made them all easy to find at the click of a button using the (free to use) Visokio Omniscope Viewer! How many of the 9,100+ Instructors are taking advantage of this information today? Very Few! How many of the 9,000,000 students are using this information to buy the best courses? A Tiny Fraction Today! Don’t take my word for it – this is what some of my Udemy Students are saying about this course and its database! I took this course from the perspective of both a student, and an instructor. First of all, the layout, video, and audio quality are very very well done. John is very easy to follow and lays things out in thoughtful, structured manner. I’m a Udemy instructor and this data would have been highly valuable right from the beginning. This tool gives me insights into competitors so I can have a goal to compete against. John also gives free datasets that he has already generated. Those data sets are worth money on their own (people pay thousands for data like this). If you want to learn more about the Udemy marketplace and love data visualizations, you might have the same experience I did here. I figured I could give this course at least 15 minutes today to skim through and see what John came up with. In just 15 minutes I learned a lot about Udemy I did not know such as what courses are the top and I discovered a lot of instructors I had never heard of that have top courses on Udemy. In just a few minutes this course was helpful for me in motivating me to continue working on Udemy and learning more about what works to get students and grow here. Thank you John! What You Will Discover in this Course – and WHY its going to help you! Course Short Description – Does this Course help YOU? Intructors Name(s) – Who are your competitors? Who are the best instructors? Instructors Tag Line – What can you learn about them? Instructor Biography – Does this Instructor have the authority and expertise to help you? Level of the Course – What do you need now? Number of Students in the Course – Is this Course selling well? Number of Reviews for the Course – Social Proof, if you need it? Hours of Video in the Course – How long is this Course? Number of Lectures in the Course – How well segmented is this Course? Language of the Course – You may not speak English? Course Price in USD$ – How much is the headline price? Don’t forget Udemy Discounts though! Instructor’s Total Number of Students – How successful has this instructor been? Instructor’s Total Number of Courses – How committed to Udemy is this Instructor? Instructors Total Number of Reviews – What do this instructors Students feel about his/her Courses? Clickable Link to Course Page (affiliate link) – Go straight to the Course page to find out more! Clickable Link to the Instructors Profile Page (affiliate link) – Go straight to the Profile page of the Instructor to find out more! Just imagine how this can help you? Using the Visokio Omniscope Viewer, you can search and view all 21,529 courses from all 9,218. Look at the whole dataset and narrow down to focus on your key criteria! Find the course you really want rather than the one that just comes up on the first page of search! Don’t waste money and time failing to find the best course for YOU! It took me six weeks to pull all this together – $1,000? As an instructor, how much extra can you earn in a month once you complete accurate competitive research? $500? As a student, how quickly can you achieve your goal by choosing the right course in the first place! How much money will this save you? $100? For a limited time, you can gain lifetime access to this data (which will be periodically updated) for just $5! But this pricing will not last long! Imagine having a huge haystack and looking for a pin and then someone comes along and gives you the world’s strongest magnet! Suddenly the impossible becomes possible in an instant! With the Visokio Omniscope Viewer and my data, you are not dependent on the “estimations” of the Udemy Search Algorithm. Poor instructors and poor courses have no where to hide. You can find the best instructors and courses! Don’t forget, I am confident that this will revolutionise your whole Udemy experience! If it doesn’t, I offer an unconditional 30 Day money back guarantee! No Fuss, No Muss, No Bother! What are you waiting for! Here is an UNFAIR advantage being handed to you on a plate!